Miami Geo Quiz #5 sat without a complete correct answer for much longer than anticipated. Congrats to those who knew both the Metrorail station and the canal on that one! This one may be a bit trickier for some. Remember to use the clues of the surrounding streetscape and structures to guide your response. Miami Geo Quiz #6: Gator under a Bridge. Source: Matthew Toro. April 17, 2014. 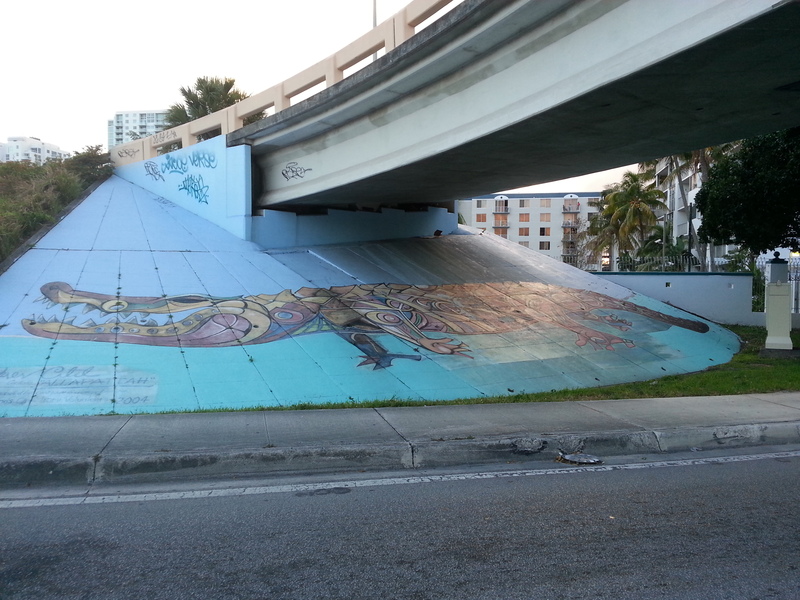 Miami Geo Quiz #6: Name the approximate intersection (street & avenue combination) at which this alligator mural under an elevated highway ramp is located. Hint: If you look closely at the photograph, you’ll find the name of nearest neighborhood written faintly. Remember to leave your responses in the comment section below this post. Awesome, Ladarr! You got it: It’s North River Drive and NW 17th Avenue, just north of the westbound on-ramp of the Dolphin Expressway (836). Be on the look-out for Miami Geo Quiz #7 later today, folks! North River Drive. I had to google map it because I wasn’t sure. In my mind it is all just an extension of Okeechobee Road that I can use to avoid traffic. You certainly seem to know where it is, Ladarr! Great job! Can you give us the name of “that creepy road by the river” to make your answer complete? Come on; you know it . . .
17th Ave and that creepy road by the river.